this place is a camping ground, full of people during holiday season. this place really beautiful with fogs and trees in the morning. we went early in the morning, I saw them already playing 'football' (soccer), one of the most popular sport in indonesia. Dear Cessy, I like this one (which I think would make a beautiful B&W print) although I actually prefer "Morning in Ciwidey" (No.889722) and would ask for that but I think it might need colour. If you think it would be OK in B&W, then I would prefer the latter. You can reach me as roger atmark adex hyphen japan dotcom. fantastica, tha fog was natural? Really exceptional work drawn from a nice portfolio. It reminds me of the work of Cartier-Bresson, a csual moment with seeming cosmic proportions. I'm also reminded of the very best of the humanist landscapes in National Geographic. I love the way the trees vertically hold the image togeter giving it a strong graphic structure. One improvement you might consider would be to somewhat lighten up that dark patch in the center foreground. But this is a minor point in an other wise wonderful image. On a lighter note, here in NYC, going to work one morning on the subway, I saw a man in a shirt that said, "if there's not soccer in heaven, I'm not going." If I see him again, I'll tell him not to worry. Thanks for seeing this, sharing this. Love the tones. The fog adds so much to the mood. One the best photographs I have ever seen in landscapes. Feeling of both human and envoirment is exelent. Childhood playing under the sunshine in a summer day. The only entertainment that some of the world's child have. And you have made this story with a B&W photograph. Don't know how to describe it, but this is an amazing photo. Thanks for sharing! You have certainly managed to catch the mood of an early morning game of footy...well done and works well in BW. Congrats for the double award Cessy...you deserve it!!! A fabulous moody picture in superb grey tones!!! The mist is truly lovely here. very well deserved awards!!! it's amazing!!!!!!!!!!! You captured it very well here. Doesn't matter the time of day, these guys are playing a little scrap, maybe kicking the ball on the way to school, or on the way to work. I love the layered effect from the mist. Well done, and well deserved awards! this really knocks me off my feet, I am floored by the lovely composition to say the least as this painting-like picture is too lovely for words. I can't think how I missed this one... It's so very beautiful, and well deserves its double award (Best in Project and Staff Choice). The lighting is wonderful and the exposure captures it perfectly. I must have this in my favourites! WOOHOO ... fabulous lighting & compo, Cessy! Well deserved awards; congrats! I congratulate you for you well deserved awards. Fabulous, what can I say, it makes me wordless. absolutely magical lighting here. beautiful result Cessy...congrats on SC award! absolutely stunning shot, cessy! you are ding so well and seem to improving in leaps and bounds! gerat work..
Beautiful, feel's like a dream ! 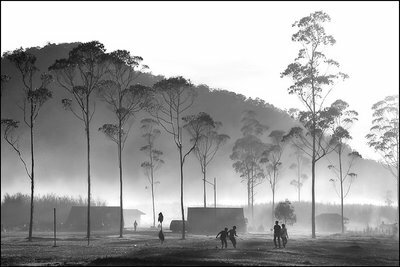 Incredible B&W landscape photograph Cessy. The sunlight through the mist is just awesome ! and.. now congrats my dear!!! Wow! Two of them! You deserve all the rest of them also, of course. This is a magnificent image. Bravo . Very Great Picture ..
A delightfully moody shot, Cessy, with the players silhouetted against the foggy background! Well seen and exellently captured! Yes, I LOVE this piece, Cessy. I don't know how to describe my feelings - I'm lost for words! I love it! the mode of this photograph bring a unique thing into the viewer soul! may be freshness?! anyway, great capture Cessy! Nice image. Soft tones and love the trees. Good atmosphere here. There's an eerie beauty to this one, Cessy! I'm with Roberto !! Very Great Pic and special mood ..! Perfect B&W Tones and original foggy shot ! in your travel dear cessy have captured a fantastic landscape, mood , and moment like this one!